We have stressed in preceding pages the fact that the practices of the early Hygienists were a composite mixture of Hygiene and hydropathy, while most of the practitioners were designated as hydropathists. At the same time, the leading journal, after the demise of the Graham Journal, was known as the Water-Cure Journal. There was an early recognition of the need for a more correct name, both for the Journal and for the system of practice. Such names were not to be chosen lightly, nor were they to be dictated by one man. The changes of names were made only after considerable deliberation and discussion. 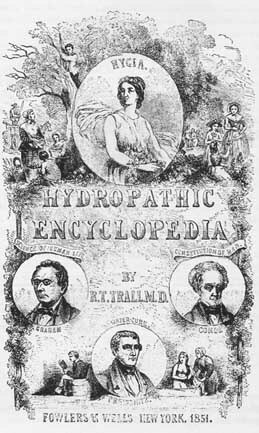 In an.editorial in the Journal, March 1856, under the title Hygeopathy, Trall pointed out that "Hydropathy or Water-Cure is such a misnomer of our system of hygienic medication that it misleads a great many persons . . ." He said: "We have an objection to misnomers . . . especially in scientific matters . . ." The terms hydriatics, hydrostatics, hydrology and hydrotherapy, he pointed out, are liable to the same objection as hydropathy. Hygeopathy, a suggested name, he objected to because of the ending pathy. He thought hygienic medication was exactly expressive of the system, but said it "is awkward and its meaning would be likely to be misunderstood." Pointing out that his practice and that of many of his contemporaries "is not a Water-Cure at all, but a hygienic cure," he said: "We want a name. We must have it. We will have a new christening. Our system will ere long be known by a name which the careless and the envious can neither mistake nor gainsay. But what shall it be?" He called upon others to think upon the problem and make known the results of their thinking. Again stressing the fact that the term hydropathy was a misnomer, as applied to his practices and that of many others of his contemporaries, he said that the practice could as properly be called "airpathy or heatpathy or foodpathy or exercisepathy or naturepathy, as these are all parts of the hygienic system." A demand was made that an "expressive classic name," derived from the "same classic father-land of letters" from which the names of the various medical systems were derived, be adopted for the system of philosophy and practice that belonged to the new school of thought. As early as 1856 the phrase Hygienic System came into use as the various practitioners came to be less and less satisfied with being designated hydropathists. The term hygeio-therapeutics, which was of American coinage, was, for this reason, favored by some who insisted on using the term therapy with its original Greek meaning--"to wait upon." Three objections were offered to this term. Some objected who said that "we want to cure" and not merely to wait upon. Some objected because the term would be difficult for the layman to pronounce. Others contended that "a small quantity of the oil of use would soon soften the asperities of our lingual apparatus," and make the public familiar with the new term. Others objected to hygeio-therapeutics because they wanted a name that "would suit the masses." There were those who pointed out, on the contrary, that the literature of a people soon degenerates if subjected to the decision of the uncultivated popular taste. Writing editorially in the Journal, February 1857, of hygeiotherapia, Trall said: "Some of the friends of our system are urging strong reasons in favor of the adoption of this term. There is certainly one argument we find it hard to gainsay--It is true. The term does, in fact, express our system precisely. In this it has an advantage over hydropathy now in use, and the hygropathy, which has been suggested as a substitute. "Hygeio-therapeutic applies literally to curing or medicating with hygienic materials or agents. Pathy has some significance when applied to drug-medication, because allopathy and homeopathy profess to cure one disease by producing another. Their remedies are intrinsically pathogenetic and induce another pathy, nosis or disease, opposite or similar, as the case may be. But, as hygienic appliances are not essentially disease-producing, there is really no propriety in falsifying our system by .the pathological appendage. "The use of the term, pathy, in connection with hygiene, degrades hygiene to the level of the drug system every time we write or use it. And besides, there is a beauty in truth, and a power in its utterance, even on seemingly trivial occasions, which never fails to make some enduring impression for good." In the June 1857 issue of the Journal Trall reproduced the following letter from Dr. J. G. Peterson of Newton, N.C.: "Dr. Trall: I have been thinking considerably about the christening of our system of medication, and am sorry to say, do not like any of the names proposed as well as Hygeopathy; and I do not like this because of its paradoxical meaning. Sanatology or Sanology might express the science of the system, as Hygeology might, yet I do not know that either is properly expressive of its practice. Hygeio-Therapia may be expressive exactly, yet calling the practitioner of the system according to this appellation, seems rather uncouth than otherwise. The same objection I have to Hygeio-Medical, only 'more so.' I think that if we must have a compound name, that Hygeio-Curapathy would do very well as expressive of what we mean. Cura means care and pathos or pathy, disease; hence Hygeio-Curapathy means, literally speaking, hygienic care, or waiting upon disease." Commenting upon this letter, Trall said: "We feel quite sure we will get the right name at last; and we have no doubt that discussion about an appropriate one will induce the people to look a little more closely into the merits of our system. Very few of our readers yet have anything like a correct view of the subject." Writing in the Journal, December 1857, George Field, M.D., said: "I claim to make Hygiene the prominent and, in some cases, the allimportant means of curing disease and restoring health. And this, I believe, is the theory, if not the practice, of all hydropathic physicians. We assert, too, that other physicians, as a class, do not make Hygiene the prominent part of their treatment, either in theory or in practice." Field was wrong in assuming that all hydropathists placed the same reliance in Hygiene as he did. But he adds: "We, therefore, need a name that will embrace the idea of Hygiene. We need this for the matter of fact that we do make Hygiene the prominent part of our treatment. We require it, also, as a distinction from other physicians, who consider it as a collateral and incidental, rather than the main part of their treatment." He adds: "Hygeopathy, then, is a more appropriate and truthful name for our purpose than Hydropathy." Field thought that the chief reason in favor of the term hydropathy was that "Hygiene, strictly speaking, embraces only those means and habits which tend to preserve health; and that in the treatment of disease we make use of water to an extent and in a variety of ways that would not be beneficial for that purpose alone; that we should never recommend well persons to take sitz-baths and wet-sheet packs for preserving health, while, on the contrary, we do advise such baths for sick people." Field suggested the use of both terms --hygeopathy and hydropathy--in order to cover both practices. He also offered, as a substitute term, that of hogeopathy. Here it will be noted that Field recognized that hydropathy violates a cardinal principle of Hygiene. He had tried to hold onto the water-cure processes by saying that "water is a natural agent, and not foreign to the human system as our drugs and that, in this way, the water treatment might, with some degree of propriety, come under the head of Hygeopathy." It is true, of course, that water is a normal element of the human body and, as drink, or as a constituent of food, belongs to the realm of Hygiene; but as a sitz-bath or a wet-sheet pack, is no more normal than a bread poultice or a fruit juice bath. It is important that we make a normal use of the normal things of life. The emphasis placed upon Hygiene was everywhere noted. When emphasizing the tremendous importance of Hygiene, the practitioners of the time were likely to add: "In my estimation, water is the smallest part of the hydropathic system." An indication of this is seen in an article published in the August 1858 issue of the Journal by Hygienicus. 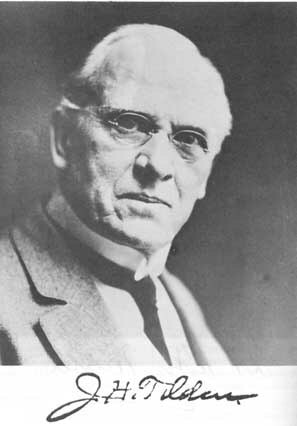 Dr. G. H. Taylor used the phrase, "Hygeio-Medical" treatment. Taylor also used the phrase, medical hygiene. C. L. Smalley, M.D., writing in the Journal, April 1856, called it the Hygienic System. In the May 1860 issue of the Journal, J. H. Stillman, M.D., writes of his "experiences in Hygeio-Therapeutics." Writing in the Journal, June 1861, George P. Betts, M.D., of Carversville, Pa., classed himself as a Hygienic physician. In the June 1861 issue of the Journal, Augusta Fairchild, M.D., a graduate of the Hygeio-Therapeutic College, tells of a conversation that she had with another woman graduate of the same school. She says: "My friend and I were talking over our experiences and anticipations in the practice of hygienic medication." In the December 1861 issue of the Journal Trall refers to "the Hygienic medical system." 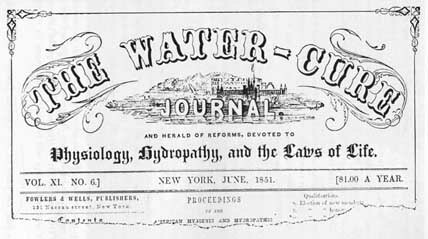 Writing to unbelievers in the October 1861 issue of the Journal, Dr. James C. Jackson differentiates between hydropathy and Hygiene in the following words: "You do not believe in Water Cure for the treatment of disease, nor do you believe in that more comprehensive system of treating human ailments which is known by the name Hygeo-Therapeutics and which embraces within its scope the use of all agents which are in their nature health-producing or health-preserving, but you do believe in the use of medicines which are poisonous, though I very much doubt that you can give a reason therefor . . ."
Solomon Fease, M.D., on the other hand, was one who objected to any change of name, either of the practice or of the Journal. His arguments were largely those of expediency. He acknowledged a certain sentimental attachment to the term hydropathy, then argued that a change of name might lose them patronage, that, as they were already well established under the old name, a new one might not draw patronage as well as the old one and that a change of name might be interpreted as a retreat. He also thought that without water applications Hygiene would be less effective than with them. Even if this last argument were true, it remained a poor basis for retention of a name that was distinctly of the "one-idea" variety, a name that was not descriptive of the practice. One hydro-hygienist, discussing the relative merits of water applications and Hygiene, presented a view that was somewhat opposed to that offered by Dr. Fease. He said: "I believe that I can cure more (chronic diseases) without it (water) by strict attention to diet, &c., &c., than with it, without this attention." 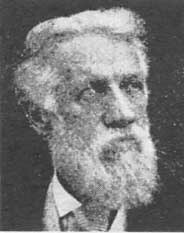 In 1861 Dr. Trall issued a small booklet under the title of Hygeiotherapeutics. In 1862 his famous lecture on The True Healing Art or Hygienic vs. Drug Medication was delivered in the Smithsonian Institute in Washington. In 1872 Trall's famous lecture, The Hygienic System, was published by The Health Reformer. This lecture was originally delivered before his classes in the College of Hygeio-Therapeutics. An editorial in the first issue of The Science of Health says: "But the leaders of the new Health Reform literature soon became dissatisfied with the term 'Hydropathy,' because it represented only one of their remedial agents; and now the more comprehensive and appropriate term of 'Hygienic Medication' is generally employed. The College of the System--the only one in existence--was chartered under the name of 'Hygeio-Therapeutic,' meaning Hygienic care, or the treatment of disease by hygienic agencies." In 1915 the Health-Culture Company published a monumental work entitled Hygeiotherapeutics by Susanna Way Dodds, A.M., M.D., who was a graduate of the College of Hygeio-Therapy. The foregoing should constitute sufficient evidence that the American physicians who abandoned drugs and took up the practice of Hygiene recognized a distinction between Hygienic and hydropathic practice and chose a name to designate the Hygienic practice. The mistake they made was in trying to designate the new mode of practice by old medical terms. It is quite true that the Latin word cura was originally synonymous with our word care and the Greek word therapia originally meant to wait upon, while the word medicine originally meant healing. But words undergo changes of meaning and the word medicine had become indeliby associated in the public mind with the drugging system, while cure was used to designate any means of treating disease that was applied to the patient with the idea of producing health by artificial measures. The word therapeutics, as defined at the time, was "that part of medicine which treats of the application of remedies to the cure of disease." All efforts to return to primitive meanings in the use of words are unavailing. When the word therapeutics is used today, it is invariably understood in its modern meaning and nobody knows anything of its ancient meaning. Benarr Macfadden made the same mistake when he had the college which he established in Chicago confer upon its graduates the degree, Dr. of Physiological Therapeutics. People did not understand it to mean physiological care, which would have been a return to Graham, but a system of treating disease by external appliances of one kind or another. To call the system hygienic medication or hygienic medicine is to associate it in the public mind with the drugging system. It is quite true that drugs do not heal; hence, as Trall pointed out, the use of the term medicine in connection with drugs is a misnomer; but it is impossible to secure public recognition of this fact. For these reasons, present-day Hygienists prefer to call this system the Hygienic System and refrain from attempting to restore the original meaning to the Greek term therapia. Inasmuch as a spurious system of hygiene is promoted by the medical profession--one that accepts processed and refined foods, haphazard eating, so-called moderation in tea, coffee, alcohol, tobacco, etc.--and rejects most of the genuine program of Hygiene, we prefixed, several years ago, the descriptive adjective, natural, to the name, thus giving us Natural Hygiene. Today most Hygienists prefer to be known as Natural Hygienists in order to distinguish them from the spurious hygienists who accept the make-believe hygiene promoted by the drugging system. 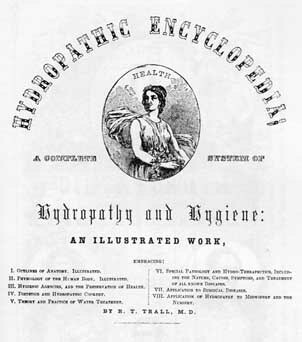 As further evidence of the determination of the early Hygienists to be known as such and to escape from the designation hydropathists, I point out that Dr. Trall's Hydropathic Encyclopedia, published in 1851, carried as its sub-title these words, A Complete System of Hydropathy and Hygiene. The book was published by Fowler and Wells of New York, who also published the Journal. In the first advertisement they ran of the book, they carried pictures of Sylvester Graham, Andrew Combe and Vincent Priessnitz. Above the head of Graham was a banner inscribed "Science of Human Life;" above that of Combe was a banner inscribed "Constitution of Man;" above the head of Priessnitz there was no banner, but just the phrase water-cure. Hydropathic Encyclopedia by Dr. Trall. and the laws of life, which belonged not to hydropathy but to Grahamism. The Water-Cure Journal and Herald of Reforms had been founded by Dr. Joel Shew, but was taken over by Fowler and Wells and Dr. Trall was made editor. On its title page it stated that it was devoted to "Physiology, Hydropathy and the Laws of Life." At the same time that it was recognized that a new name was needed for the system of practice, it became recognized that a new name was required for the Journal. Writing in the March 1861 issue of the Journal, Trall said: "We have for some years contemplated a change in the title of the Water-Cure Journal--The Herald of Health, the subtitle, Journal of Hygienic Medication, provided no more suitable rechristening should be proposed." Such titles as the Journal of Hygiene and the Hygienic Teacher were proposed. Editorially Trall said, December 1861: "So soon as we can select a title which will be acceptable to our readers, as enduring as time and precisely expressive of the system we advocate, we shall adopt it. Of all the names thus far propounded, that of 'Hygienic Teacher' seems to be the favorite and next in order is 'Herald of Health.' " With the July 1862 issue the name of the journal was changed to Hygienic Teacher. Writing editorially in this same issue, Trall said: "In unfurling our new banner to the breeze, we do not disclaim, retract, nor recede from any principle we have ever advocated in any book or journal. We have always contended and explained that our system--The True Healing Art--is Hygienic, not Hydropathic, although water always was and always will be, prominent among its remedial appliances." After a year the name of the Hygienic Teacher was changed to The Herald of Health. The magazine was acquired by Dr. Trall, who after about three years relinquished control to two of his graduates. Trouble arose between Trall and the new owners and Trall issued for a period of about three years a new magazine entitled The Gospel of Health. Later, Fowler and Wells started a new magazine under the title of The Science of Health, of which Trall was the active editor. The new magazine placed greatest stress upon Hygiene and less and less upon water. Hygienists did not totally abandon their use of water applications, but reduced them to a subordinate place. Other evidences of the emphasis upon Hygiene and the trek away from hydropathy are found in the titles as well as the subject matter of other Hygienic magazines of the time. Dr. Jackson called his magazine The Laws of Life. Mrs. White, leader of the Seventh Day Adventists, who embraced Hygiene and propogated it among her religious followers, entitled her magazine Health Reform. Dr. Walter entitled his magazine The Laws of Health; later the title was changed to Health. 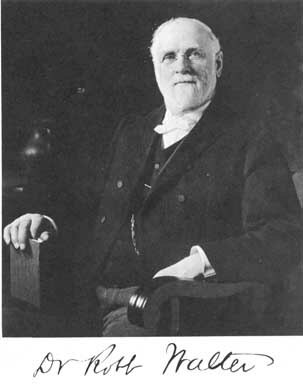 Dr. Dodds published a magazine under the title of The Sanitarian. Mr. Albert Turner, who was for years with the Fowler and Wells Publishing Company and associated with Trall on the staff of The Science of Health, founded and published Health Culture Magazine, which, during the first 30 years of its existence, at least, was a Hygienic publication. Tilden's magazine, at first known as The Stuffed Club, then changed to Philosophy of Health and later to Dr. Tilden's Health Review and Critique, was published as a Hygienic magazine. Everywhere the trend was away from hydropathy and the emphasis was placed upon Hygiene and health. The argument has been offered that Dr. Trall was a hydropath and that his Encyclopedia proves it. The argument is quite true if we permit Dr. Trall to die in 1851. But as he lived some 26 years longer and his philosophy and practice underwent considerable evolution during that period, it is as inaccurate to judge him by the title of the Encyclopedia as it would be to judge him by his degree, Doctor of Medicine. Such an argument would cause one to say that Martin Luther was a catholic priest, for he certainly was before he became the leader of the German reformation movement. Just as Luther became a protestant, so Trall became a Hygienist.